I have finally begun work on my first stormraven and would love to hear any input people may have. The various conversions/adaptations that are appearing are very much what I had in mind for this model and I have been feverishly looking around to see what I might want to use on my own version. Kudos to any and all on the forum(s) that have posted their work, it's been a true inspiration, especially Pig Of Sparta and Inache. I was planning to smooth off the nose by covering over the nose mounted weapons, but I have decided against this for now on balance. I would like to magnetise the tail in some fashion too, still thinking about how to do this and ensure its a strong connection. Any and all suggestions/criticisms are more than welcome! The turret looks like it could use a targeting sensor if you have a spare. IMHO, I think the tail is unessesary. I'm not qualified to make that judgement by any means, but if you have repulsors on both sides of the nose and wing tips is the tail needed? A codex is NOT made of special characters. The tail is most likely not 'needed' as such to aid flight - I dont really think the thing would fly at all to be honest - but it does help visually stretch the model out. Its more there for the proportions/silhouette really, but I'm just a bit concerned it makes it overly long - its now just short of twice as long as a land raider... If its kept, which I'm leaning towards, I will build the detailing up on the roof of the extension to make it look like an integral 'spine' that runs down to the tail. I think the first pics are the way to go. It looks large and proper, not too long at all. The Tervigon and Termagants on my right unleash a salvo of spines and grubs at my small platoon, forcing Commissar Hogan to order his men to bite the Emperor's glorious dirt and go to ground. Casualties are light, and under Hogan's gaze everyone claims the dirt is delicious. Six-barreled rotary cannon capable of solving 6,000 problems per minute. I love assault cannons. "Are there wolves on Fenris?" I ask. "Go and look for yourself" he tells me, "Go on". I quite like the stubby look....looks more "business" like!! As you said a spoiler similar to a landspeeder would look good! Might have to try that on mine! 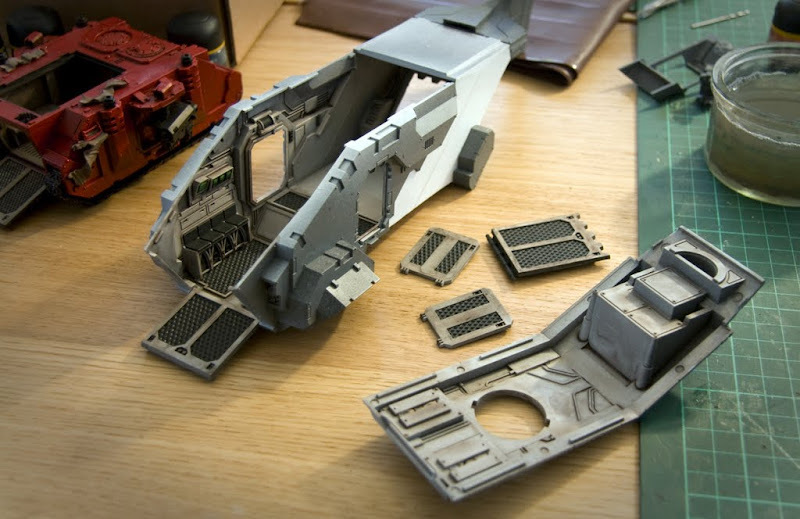 I Liked aspects of GW's Stormraven, but I wasn't impressed with it on a whole. It just didn't seem to add up. But, you have found exactly what is missing. And I am really liking your modifications here. You have placed me in a dilema though, lol. Donno if I want to continue with what I was doing, or follow your route. I think you've done well with the plasticard extension. It really looks a lot better than the original which to me loos like "Tweety Bird" .... wanting to make "I tawt i taw a puddy tat" as you swing it around!! In the image without the wings it now looks so much like the outline of a CH53 super jolly green giant helicopetr .... I think the tail must remain... just the lengthened fuselage and the reduced height of the top turret by way of the weapon mount...actually gives it a better streamlined look. Well GW fluff does state in many places that the Thunderhawk is not aerodynamic and without its computers it would completely fail... recently described in "Battle for Kadillus" novel... Similar to the F117.. an inherently unstable airframe which remians aloft on power and a massive dose of computing power... or the machine spirit in 40K. i really like what you've done with the Storm Tweety ...er...Storm raven... it's literallky and metaphorically filled in what was missing! I agree that the version with the tail looks better. This conversion is definitely what the model needs. Makes it look like a shrunken Thunderhawk, which is really what it is anyway. Good work! "I shall teach them to fear my path and avoid it." 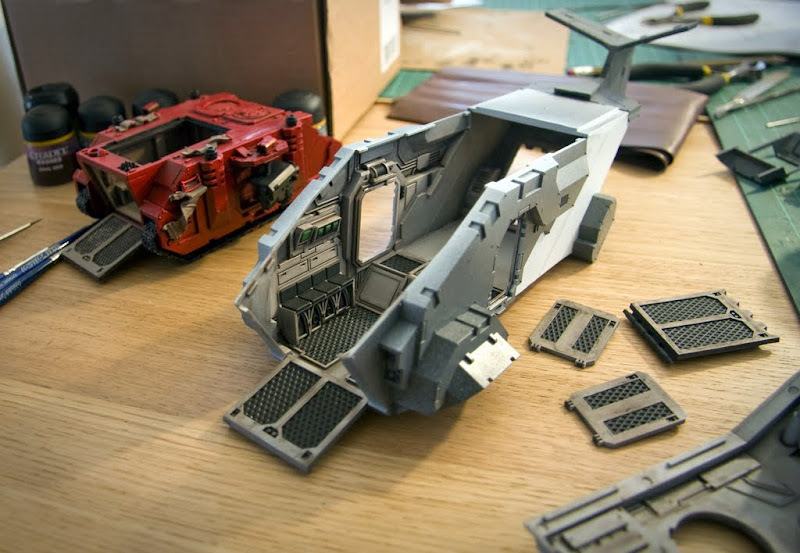 CTK - your 'hunter-killer' stormravens look excellent! I wouldn't abandon them, but perhaps have them as varients, allowing you to have both! what I have done here is really quite simple to be honest - I was waiting on templates from others, but to be honest, the way the back of the hull goes together makes them unnecessary, its very straight forward. zxyogi - I do know what you mean about the short 'sawn-off' version, it looked more brutal somehow! in practice though, it just didn't quite work the way I wanted so I stuck with the tail. 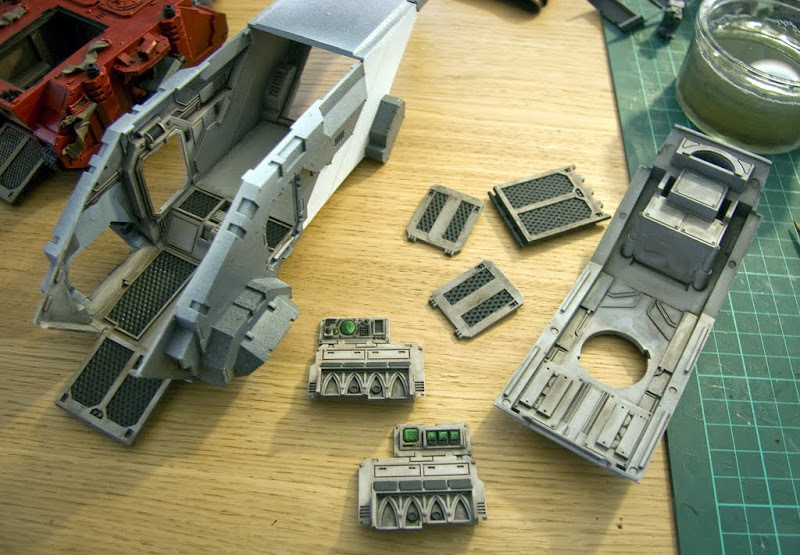 Managed to get some more work last night, mainly focused on the magnetising and tidying up of joints etc. Fairly happy with the turret now, although I will probably lower it a bit but cutting down the weapon mount slightly, maybe 2-3mm, to make it sit that bit tighter to the body. I have the 'tail fins' for want of a better term cut from the engines test fitted to the back - what do you reckon? The tail is glued now and the wings magnatised as there was an obvious and secure way of doing this. They aren't going anywhere! I am very tempted to shorten it by about 12-15mm so the back of the mid-point of the 'tail fins' is in line with the back of the engines. A shame to break apart what's been don't, but it may bug me otherwise...! More detailing to be done, especially under the wings, rivets to add and a base to sort out/counter weight - but I'm itching to paint this thing! 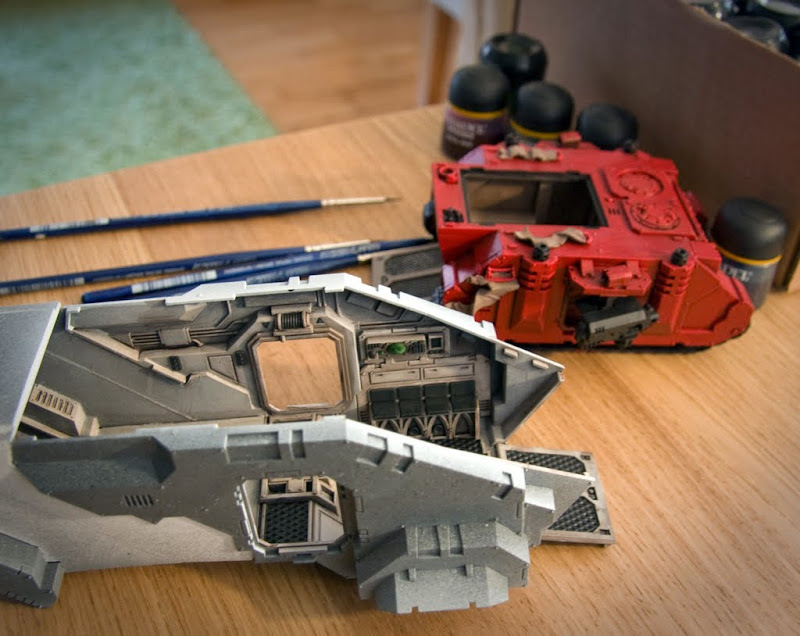 I have to agree with you, that version of the stormraven looks so much better than GW version. I'm just not all that excited by the basic GW one - other than the potential in it. I am thinking I'm going to need to shorten it slightly - probably going to try and remove 12-15mm from the extension, it is going to bug me otherwise I think! A vast improvement over the original model! Gorlak that is an awesome conversion!!! I agree with you, the GW version is ugly yet has so much potential. I like what I see! Looking forward to more updates! But every 40k player knows that more shots = more accuracy!!!!!!!!! Can see what you mean about the rear end.....think you only need to loose it off of the tail piece! Like what you done with the extra bracing on the tail. Some speedy updates having finished the painting of the interior. There is actually quite a bit more external detail on there now as well, but no pics of that yet though. Further inspired by Hits_the_spot's project, I will be adding a bit to the exterior details. Hope you like - I will try and get some better macro close ups of those internal panels when I get home tonight. From what i can see of the internal space so far, it seems to be painted very well! Looks great to me. I think you might wanna do something on the part behind the turret, because it's kinda plain, which is what makes you docus on it. Even just a couple of wires going from the turret to the tail area would make it look more realistic and defined. Did you ever get this marvelous model finished? Nice conversion, but doesn't the turret on top have its field of fire greatly restricted with the relocation? It would be quite difficult to shoot at something on the ground without the pilot having to drop the nose and hover. have to say thanks for these pictures and this idea...you took just the right angles for me to be able to mimic most of the modifications on my own raven with .75mm and 1.5mm thick card for the extensions. Crafting a Chapter - Notes, Thoughts, Commentary. Worthwhile or not, it is what it is.